The last few weeks of my life have consisted of unpacking, unpacking and a bit of unpacking. It’s left little time for me to have fun and play around in the kitchen. So lately I’ve been planning meals that can literally be thrown together in minutes. This dish goes from the fridge to the dinner table in less than 10 minutes! It’s packed full of flavor and you can add any of your favorite veggies for a customized meal. For my husband who is not a veggie lover this was a wonderful way to work some veggies into his daily meals. I paired the skewers with a side of brown rice and dinner was complete! 2. Place the shrimp in a bowl and lightly sprinkle with the Cajun seasoning. This seasoning has quite the kick so use carefully! 3. 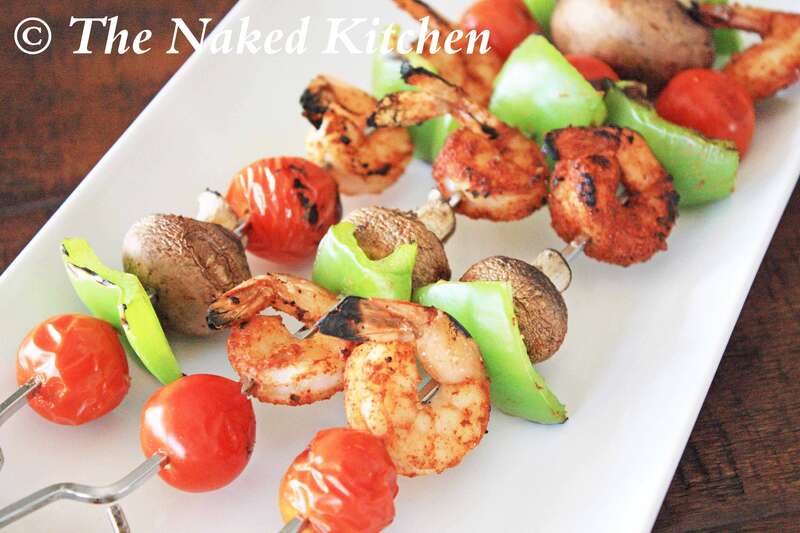 Assemble your skewers with the shrimp and veggies and place on a heated grill for 3-4 minutes, turning once during cooking. 4. Serve with a side of rice, pasta or a salad. Nutritional info will vary greatly depending on what vegetables are use. My husband loves spicy food so this meal was a total hit with him. I think mild salsa is too spicy so I actually skipped the Cajun seasoning and grilled my shrimp and veggies with just a sprinkle of sea salt. Then I dunked them in this delicious dipping sauce I made. This is a great alternative for kids that don’t want the spice as well.